I didn’t even get out of town without losing my way – what made me think I could make it all the way to Portomarín without incident? And by incident, I mean without breaking something, losing something, or, I don’t know, getting swallowed up by the Spanish countryside. I do remember saying a prayer for the intercession of Saint James. A very nice older man saw me looking lost and calmly pointed out the way to me. I bet he does that every week of his life, given the number of lost pilgrims that must come by him in Sarria on their way out of town. 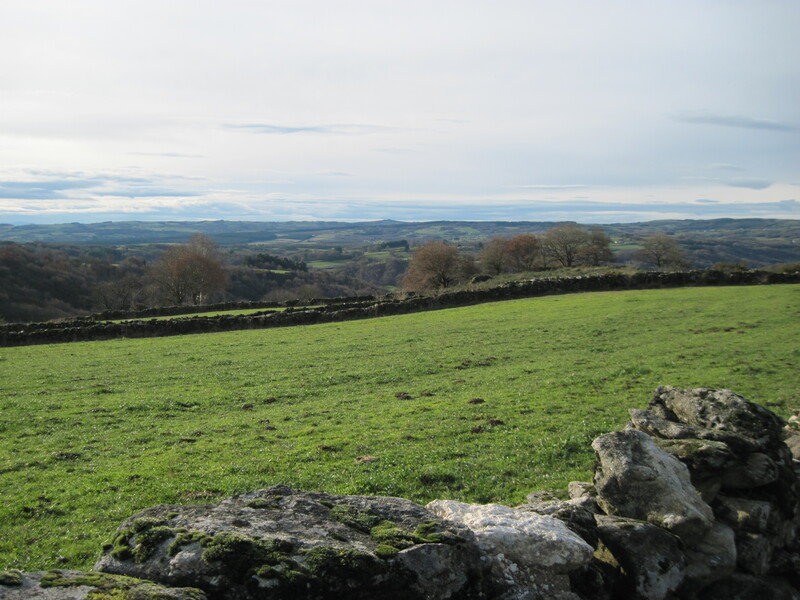 Walking in December typically means you will have a good section of the Camino to yourself. Whether by choice or coincidence, sometimes luck, or sometimes just a 10 to 20 minute lag between the time you leave in the morning and the time everyone else leaves, you can have the road to yourself if you want it. That’s amazing. The intense solitude is something you won’t find as easily during the summer months when the Camino is more populated. I was about a third of the way into my day when I came upon a family from Mallorca. Dad was hustling everyone forward, the mom was pretty quiet, and the daughter, who was probably in high school, kept complaining that her backpack was too heavy. Dad was very seriously concerned that they would get to the next town to spend the night and they wouldn’t be able to stay in the same place. He kept warning them that if they didn’t keep moving, dire things would befall them. We walked a bit farther and stopped for lunch in a very small place with a dining room in the back. They sat with me and we started talking. Their claim to fame was that they had cousins who went to school with someone in Rafael Nadal’s family in Mallorca. I called them – to myself, of course – the Mallorquinos and I wondered if I wouldn’t have identified myself similarly if I lived in Mallorca, needing to claim a relationship of any kind with such a famous athlete. 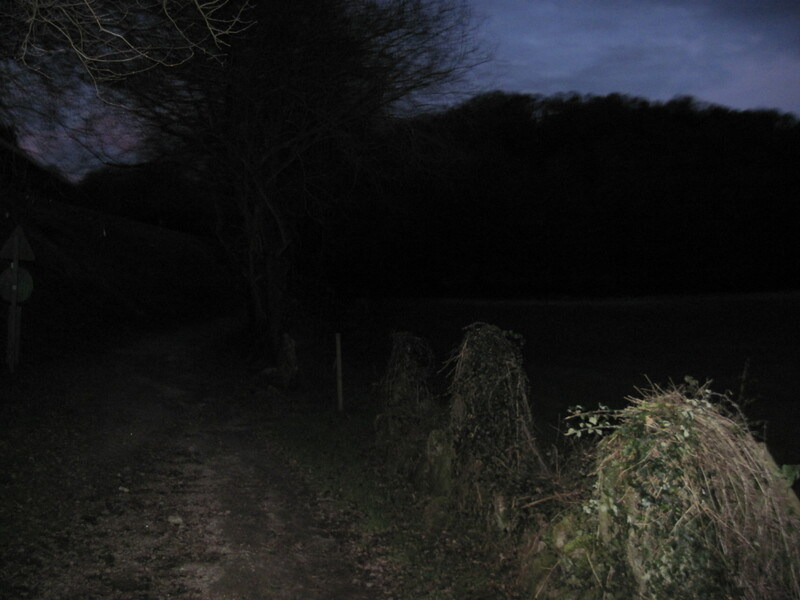 We set out again, this time walking together, and I stopped again a while later, just to catch my breath and ask myself just how it was that I thought I could do this. 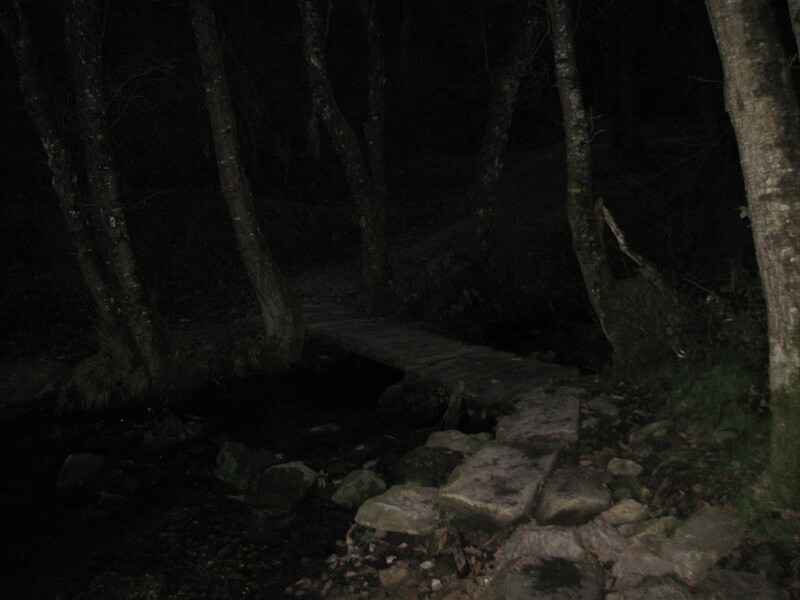 After all, I had only a few hours experience walking the Camino at that point. Dad walked up to me after about two minutes sitting and said, “Vamos, señora. Vamos!” And in that moment, I stopped feeling sorry for myself and started walking again. While I never fully adopted his fears about places to spend the night, I did feel that he was so right. I didn’t come all that way with all that gear to sit alongside the Camino. I was there to walk. We arrived at Portomarín mid-afternoon, I was amazed that the way into town was via a tall staircase but I read later about how the entire medieval town was transported to the top of the hill after years of dealing with rising river waters. When the water level is low, you can still see sections of the old town peeking out of the water. 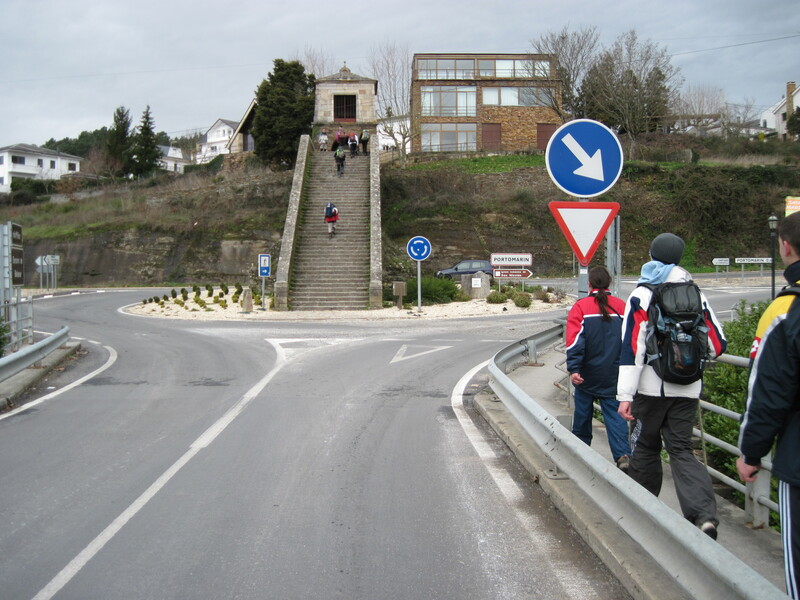 That staircase was what linked the Camino to the town and a place for us to spend the night. I let the Mallorquinos go and found a pension with private rooms and a shared bath. I must have lain there on my neat little twin bed for an hour without moving, wrapped and bundled in my sleeping bag because there was no heat. But I had completed my first stage of this winter holiday walk and I was so happy. I walked into town and found a diner with a young woman behind the counter. When I asked what food was available since it was still kind of early for dinner by Spain standards, she replied, “We have espaghettis with hot salad or espaghettis with cold salad.” I opted for cold at which point she opened two cans of Chef Boyardee and warmed it up in the microwave. Disappointed that I couldn’t get inside the beautiful church, I photographed the outside of the building and went back to the unheated pension to spend the night. It was so cold – indoors – that I boiled water on the stove in the common area just to be able to hold cups of hot water in my hands while I watched a Spanish-dubbed re-run of the American comedy series, Reaper. The next morning, I met up with the Mallorquinos again at a restaurant having breakfast, but as soon as we got out of town, they left me in the dust and I never saw them again. 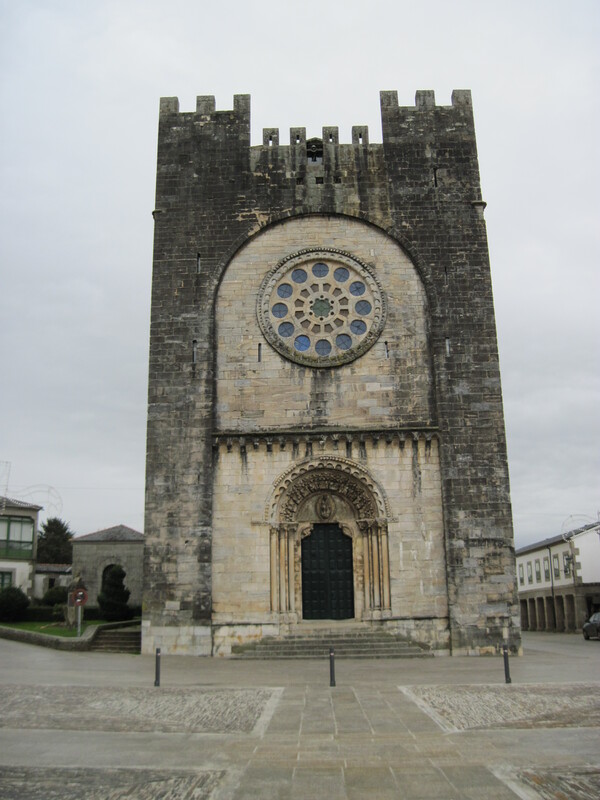 I imagine they got to the next town – Palas de Rei – right after lunch and were safely tucked in long before I got there. The daughter had sent her pack along with one of the “mochila transport” services that take your gear to the next town. She looked happy. Previous: Previous post: What is an Amigo? Loved reading this! My husband and I are planning our Camino for Dec-Jan. We’d been hearing the albergues turn off the heat in the winter! Yikes. The Chef Boy Ardee story is hilarious! (Probably wasn’t so funny at the time). I never knew the history behind those famous stairs. Thanks for sharing that!